How To Make Your Contact Center Run As Smooth As A Swiss Watch....Even Better! A contact center is an integrated, and usually automated, communications system that coordinates all telephone and electronic contacts between an organization and the public. 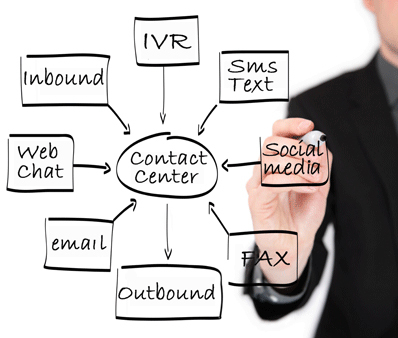 The goal when talking about contact centers has always been to connect your business to your customer. Customer experience has become the new battleground for competitive differentiation. When you look at customer needs they involve social media, self-service, mobility, texts, chats and email. These are all newer methods of communication, not usually associated with call centers, but nowadays call centers are really contact centers. In the past businesses have competed through products and pricing, but they now find themselves having to compete through service. One of the key factors for a business is the need to be able to interact with its customers in a manner which makes the customer want to interact with them. Therefore, the cloud contact center industry is expected to grow within the next three to five years as more businesses start to move into the cloud in order to be able to offer the features, functionality, and the type of customer experience their customers are demanding. For your contact center to truly be an asset to your business objectives it must run smoothly at all times....efficiently and cost effectively. Competition is fierce and you can't afford any issues at any time. Performance, or lack thereof, shouldn't keep you up at night. To the contrary....you should sleep like a baby knowing everything is running like a well oiled machine. To that end the best decision you can make is to implement a robust cloud based system which covers all your requirements and enables you to not only beat your competition, but to look like a real hero and invaluable asset to your organization's bottom line. This system should make it easy to cut costs, improve business continuity and support business growth. It should give you the freedom to build your ideal communications solution without having to start from scratch. You should also be able to customize anything it does to fit the exact needs and processes of your business. These articles provider further insights on how technology can significantly improve contact center operations...and therefore the bottom line. For free assistance to decide just what this perfect contact center solution can look like for YOU...and free help designing a custom solution just for YOUR organization...simply click on Get Quote and ask us. It’s as easy as 1, 2, 3. Additionally, to learn more about how to take advantage of the benefits of software defined networking technology as an aspect of your contact center solution click on SDWAN.